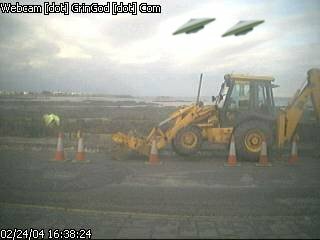 As if it wasn’t enough to have a sighting of Osama Bin Laden in Guernsey, I have just managed to capture this image of an alien invasion of Guernsey. Is there no limit to the wierd and freaky stuff that goes on in this island. One minute Bin Laden, the next UFO’s…. it wouldn’t supprise me if I had Elvis turn up tomorrow to have his picture taken. If I’m not carefull I’ll be getting Yeti’s and flying pigs queuing up outside just so they can have their 5 minutes of fame. Osama Bin Laden – Alive and Well!! !